Vanity never felt so good. 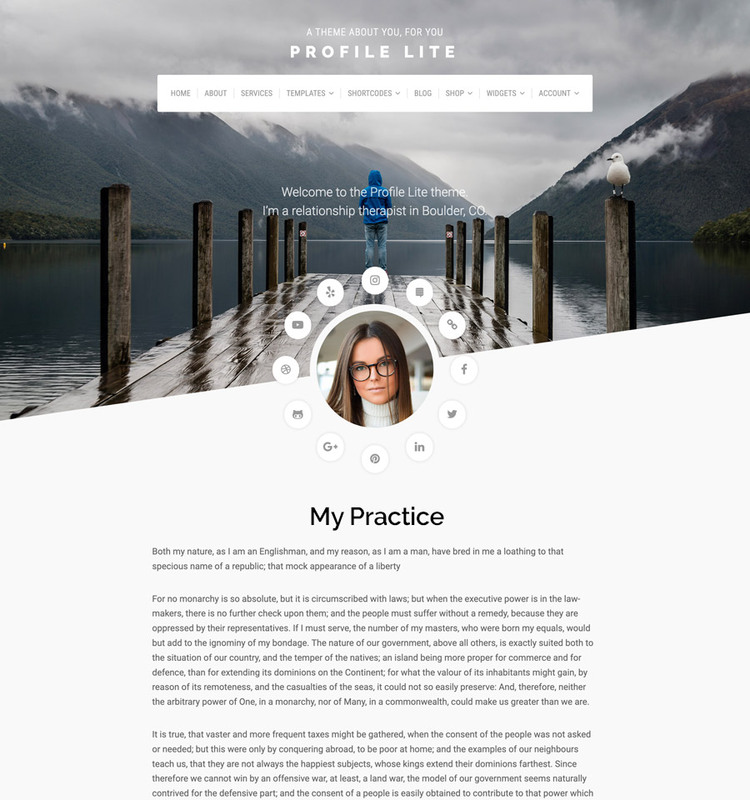 Profile is perfect as a resume, social media hub, portfolio and professional presence. Profile Lite is the free version of the Profile Theme. It’s designed to be an online hub for everything about you. The theme is an excellent website solution for speakers, coaches, personal trainers, therapists, and any professional in need of showcasing their skills on the web. Think of it as your digital business card. The home page template for Profile Lite features a social media menu that displays icons in circular layout around your profile picture. Upgrade to the pro version in order to display a Twitter feed beneath your profile picture. So, the entire world can see what food you’re currently enjoying! 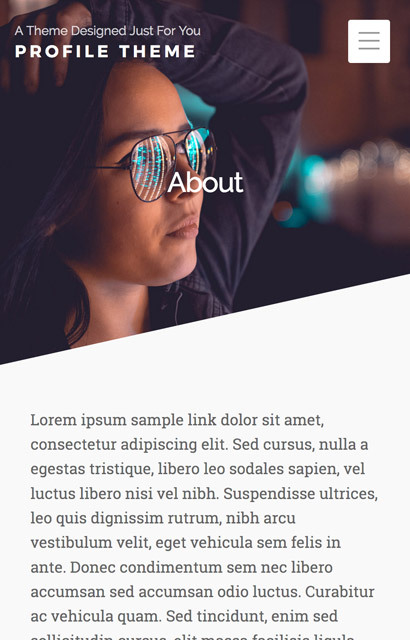 Profile Lite features a responsive grid, Gutenberg optimization, retina screen display, and HTML5 and CSS3 development. Additionally, theme utilizes the latest WordPress functionality. For instance, a custom header video can be displayed as a background on your home page. Also, a logo can be added and resized with ease in the WordPress customizer. Like all Organic Themes, theme options are located within the WordPress customizer. Watch your changes take place in real-time. Change colors, fonts, layouts, and more with ultimate ease. Setting up the Profile Theme within the customizer will take a matter of minutes. Additionally, default options are already set. So, the theme is ready to use out-of-the-box. Additionally, the theme is designed to work with the Organic Builder Widgets plugin. The plugin provides the ability to create dynamic page layouts with ease. Best of all, it’s all accomplished using custom widgets and the native WordPress customizer. As a result, there is no fumbling around with confusing proprietary interfaces and overwhelming options. You’ll look good using Profile Lite. Start building your website with the Profile Lite!